Samsung Galaxy C5 Pro is being lined up for a launch after the company launched the Galaxy C7 Pro as well as a new Samsung Galaxy C9 Pro, which came out late last year. The Galaxy C series first came out in 2016 and initially, it was only available in the Chinese market. Well, this is no more as the tech giant has recently been pushing the C series handsets in other markets across Asia, including India. Since the launch of the Galaxy C9 Pro, talk of the Galaxy C5 Pro and C7 Pro started emerging and sooner than later, the latter was secretly launched in China last month. Earlier this month, an alleged Samsung Galaxy C5 Pro appeared on the official Wi-Fi Alliance website with model number SM-C501X, an indicator that it was a successor or rather a variant to last year’s Samsung Galaxy C5. At the time, it was revealed that the Galaxy C5 Pro will ship with Android OS on board, but it unlikely that Samsung will install the latest Android 7.0 Nougat out of the box. In a new leak about the same Samsung Galaxy C5 Pro, it appears that the South Korean tech giant will not be stepping up the battery capacity, just like it happened with the Galaxy C7 Pro when compared to the initial Galaxy C7. The C7 and C7 Pro share the same 5.7-inch Full HD display screen and a 3300mAh battery. 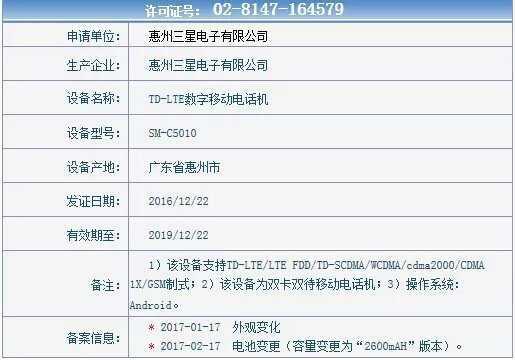 As for the Galaxy C5, it comes with a 2600mAh battery and if this leak is to be believed, the same unit will be used on the C5 Pro. Given that the Galaxy C5 and C7 have the same chipset, it is possible that Samsung will do the same for the Galaxy C5 Pro and C7 Pro. Since the latter has a Snapdragon 625 on board, the former should also ship with the same chipset. You can also expect to get 4GB RAM, 64GB of expandable storage as well as 16MP lenses on the front and back of the phone.